2004 Keel Boat + Peace Medal Nickels, 2005 Bison-Buffalo + Western Waters Nickels, Proof Nickel SETS, Dimes Proof Sets, Statehood Quarters - "S" clad, State Hood Quarters in Silver, Satin Finish State Quarters - "P"+ "D" mint, 1976-s Bicentennial silver 3 coin set, Kennedy Half Dollar Sets "Silver"& "Clad" proofs, Morgan Liberty-Head US dollars (1878-1921), Peace Silver U.S. Dollars (1921-1935), Eisenhower Dollars (1971-1978), Susan B. Anthony dollars (1979-1999), Sacagawea dollars (2000-2006), Presidential Dollars, Mint State Un-circulated Silver Eagles, Silver Eagle MS69 SETS, Silver Eagle PROOF Dollars + Sets, American Eagle GOLD coins, 1 oz GOLD eagles, Buffalo 1oz. US gold, Platinum American Eagles, MS70 coins. Please visit and bookmark our new site. Items shaded in bright blue have been moved to our new site. The following coins are graded by PCGS (Professional Coin Grading Service). PCGS is perhaps the most popular independent third party coin grading & certification service today. The grading scale goes from 0 to a maximum of 70. For example a grade of 10 would be a very poor condition. A grade of PF-60 (or MS-60) or above would be an uncirculated coin. PF-70 would be absolute "perfection". Some experts say there is no such thing as a "perfect" coin. In fact, some grading services will not place a grade on any coin above MS-69 or PF-69, one of the highest grades available. Even attractive coins directly from the US government Mint often have microscopic flaws keeping them from meeting such high standards. The coins listed below have been graded, certified as genuine, encased in a tamper resistant holder, and assigned their own unique serial numbers. Quantities are very limited. These very high grade certified PCGS graded coins are the cream of the crop. We know you will be pleased. Satisfaction Guaranteed ! New - 2007 Tenth ounce - New! Design is similar to the 1 ounce holder in picture. Beautiful 1/10th ounce Mint State (MS) brilliant uncirculated gold coin. Each of these 1/10th ounce gold coins is certified, graded, and sealed in a PCGS slab holder similar to the one in the picture. Certification serial numbers are different for each coin. Each of these 1/10th ounce gold coins is sealed in a PCGS slab type holder similar to the one in the picture. Certification serial numbers are different for each coin. Let us pick the date from our current inventory and you save! NCG certified - Special Purchase. 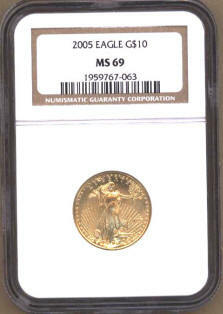 We made a special purchase of "NGC" certified 2005 tenth oz gold eagles - each is graded/slabbed by NGC as MS69. This item has been moved to our new webstore. Beautiful 1/4th ounce U.S. Mint State (MS) brilliant uncirculated gold coin. Certification serial numbers are different for each coin. Each coin is sealed in a special First Strike PCGS slab type holder. See bottom of page for more details. NCG certified - FOURTH ounce Gold Eagle coin - Special Purchase. Beautiful 1/4th ounce Mint State (MS) brilliant uncirculated gold coin. 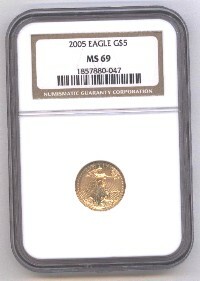 We made a special purchase of "NGC" certified 2005 fourht oz gold eagles - each is graded/slabbed by NGC as MS69. Each coin is sealed in the PCGS slab type holder shown in the picture. Slightly larger than the 1/10th oz size above. 1986 1st year of issue! Beautiful 1/4th ounce Mint State (MS) brilliant uncirculated gold coin. Certified serial numbers are different for each coin. Sealed holder (as shown in the picture) adds valuable protection for safe handling and storage. Note that the year date is in Roman Numerals. * What is a First Strike? Each Sealed Box of Gold, Silver and Platinum Eagles from the United States Mint contains a tape or seal that is dated and signed by an employee of the U.S. Mint. The date determines whether the coin is one of the first strikes (from the first sets shipped from the US mint). On these limited coins, PCGS will seal the coin in their "First Strike" plastic slab holder with the words " First Strike" inside the PCGS holder. For other US Mint coins that are not date sealed by the mint, those shipped by the Mint during the first month after the coin is issued are considered first strikes. Although the First Strike coins have the same design as expected future production, they will have a different Serial Number than regular Gold Eagles Graded By PCGS. to check out. You may remove items by clicking on the View Shopping cart button. Click checkout to use PAYPAL to pay with your Visa or Master Card. You may also email us your order. We accept money orders, cashiers check, or personal checks as payment. Thanks! We are proud of our reputation of pleasing our customers…..with Many – Many satisfied customers. We hope you will become one of them.